I wanted to create the warm and cozy feeling of Christmas Eve where the fire is crackling, Christmas music playing in the background, cookies baking in the oven and lights lit up all around. AAhhh I can picture Christmas already! Okay so my card is standard A2 size. My card base is Bazzill and my layer and patterned paper are from Recollections. I used my Martha Stewart Snowflakes punch to make a small border along the top. I used various stamps for this card. 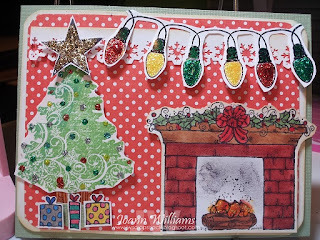 The fireplace stamp is from Hero Arts and the string of lights is from Bo Bunny's new Christmas line. The Christmas tree is from Hot off the Press and presents are from a stamp I got in the dollar bin at Michael's. I colored the fireplace stamp using my copics E29, E33, E35, 100, R24, R29, R59, Y19, YR02, YR68, G21 and G24. The Christmas tree was colored using copics G21, G24, G28 and G85. I colored in the presents using my gel pens and the star and string of lights were stamped in Momento Tuxedo black ink and colored in using stickles. I used stickles to add lights to the Christmas tree too. 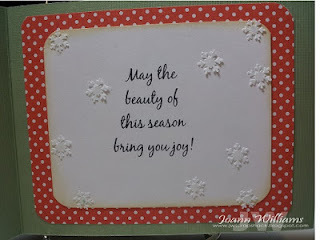 I LOVE this sentiment "May the beauty of this season bring you joy!" 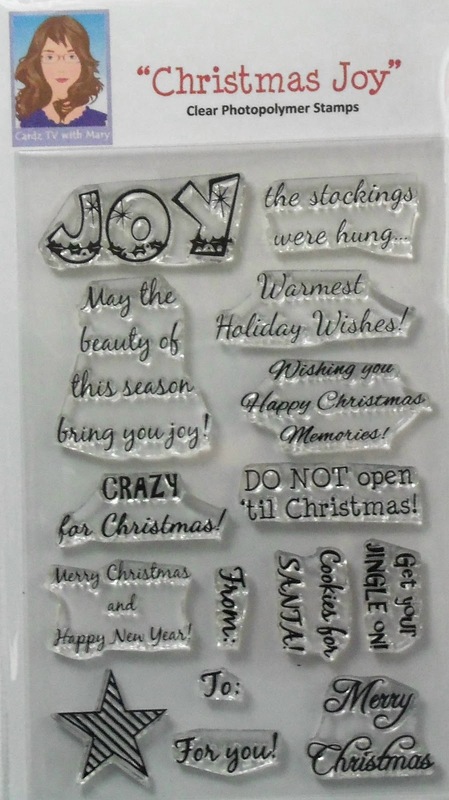 The sentiment is from the Christmas Joy stamp set from Mary's Cardz TV Stamps. 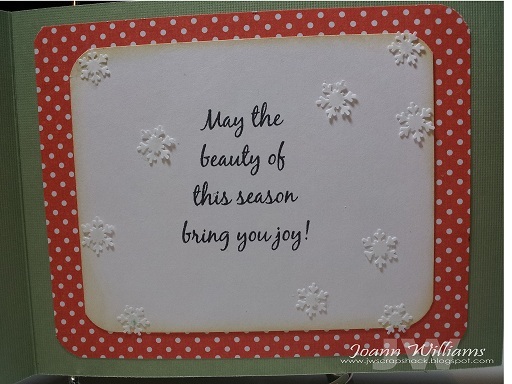 I used the negative snowflakes from the border I punched on the front of the card for the inside to give it that "Christmas" feel. Well I hope you enjoyed my project for this challenge. You can join in on this fun challenge by linking up your project below! 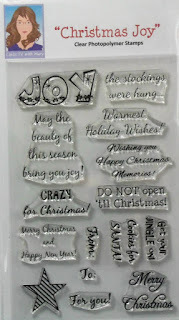 If you want to purchase this stamp set or any other Cardz TV stamps, you can purchase them HERE. Really cute!! Awesome how you put the stamps together from different companies!! Your card is sooooo. Ute! love the fireplace! Love the card, think I might just have to join in on this challenge. Could you shoot me a email with your snail mail address so I can get your goodies out to you. Already did! Thank you so much and you should definitely join the challenge. Would love to see what you do! What a fabulous scene you've created here, Jo. I can almost feel the warmth from that fireplace. This card made me think of Christmas' past in our family room with our five kids sitting around the tree with the fire blazing on Christmas Eve reading The Night Before Christmas (our tradition). Thanks for helping me remember those wonderful times. Super cute scene Jo, I like how you added the Christmas lights! I sure could use a fire right now. Here in Texas it still feels like summer! Jo, I love your card! It just screams hot cocoa and fireplace to me! Awesome colors and I love how you put this together! aww Thank you so much!! I sure could go for some hot cocoa right now!!! I love this beautiful card. I agree it screams hot cocoa, warm fires, and just wonderful memories. Thanks so much for sharing it with us. Aww you're welcome and thank you dear! Such a great card! I love the fireplace and tree. The lights look great! I have that stamp but haven't used it yet. Now I need to! aww Thank you Laura. Definitely use that stamp! Its awesome! Super cute scene. I am actually looking forward to Christmas! Thank you Georgiana. I am looking forward to Christmas too, my favorite Holiday! Reminds me of Christmas eve !! wonderful card girl...Hugs!! This really does paint the picture of Christmas! Just waiting for Santa to come down the tree! Of course after everyone goes to sleep and the fire is out! LOL :) XOXO, Julie. awww.... wonderful, festive scene! amazing details, too! such a pretty card, Jo!